Free download the best free DVD to iPhone ripper to convert any DVD to iPhone X/8/7/SE/6s etc, without effort at all. Q: I love to create DVDs by myself for fun, so I have a lot of DVDs. But recently I want to convert these DVDs to my iPhone 7 badly, because I want to share them with more friends and colleagues whenever and wherever possible. Is there any good-to-use DVD to iPhone ripper? To play a DVD on iPhone is seeminlgy impossible due to the lack of DVD drive and MPEG2 decoder which are essential for DVD playback. On the other hand, quite a lot of suggestions point out it's a good idea to rip DVD to digital videos which can be compatible with iPhone. How to rip DVD to iPhone? DVD to iPhone ripper becomes the best helper which offers a super simple way to convert DVD discs to iPhone. Here we focus on how to use the best free DVD ripper for iPhone to convert DVD to iPhone while keeping high quality. WinX DVD Ripper is the first-class free DVD ripping software in the market. It is available to convert DVD (movie/TV show etc.) to iPhone X/8, 7 (Plus), 6s (Plus), SE, 6, 5s, 5, 4s, 4 while keeping vivid images/hi-fi audio of output file. It can also rip DVD to iPod, Apple TV, HTC, Samsung, PSP, as well as various video/audio formats, like DVD to MP4 (H.264/MPEG-4), WMV, MOV, FLV and MP3. Before we choose a DVD rippr for iPhone from the big market, we need to have a full understanding of iPhone video/audio specs. 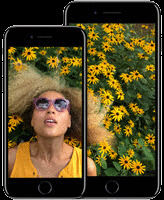 Every iPhone model can support 3 formats, H.264, MPEG-4 and Motion JPEG. But there are some little differences depending on different generations. >> Up to 1080p, 30 frames per second, High Profile level 4.1 with AAC-LC audio up to 160 Kbps, 48kHz, stereo audio for iPhone 4s/5. >> Up to 1080p, 60 frames per second, High Profile level 4.2 with AAC-LC audio up to 160 Kbps, 48kHz, stereo audio for iPhone 5s/6 (Plus). >> Up to 4K, 30 frames per second, High Profile level 4.2 with AAC-LC audio up to 160 Kbps, 48kHz, stereo audio or Dolby Audio up to 1008 Kbps, 48kHz, stereo or multichannel audio for iPhone 6s (Plus), SE, 7 (Plus). >> Up to 2.5 Mbps, 640 by 480 pixels, 30 frames per second, Simple Profile with AAC-LC up to 160 Kbps per channel, 48kHz, stereo audio. iPhone 6s (Plus), SE, 7 (Plus) also support Dolby Audio up to 1008 Kbps, 48kHz, stereo or multichannel audio. Why WinX DVD Ripper Is Qualified as the Best Free DVD to iPhone Ripper? Besides well handling unprotected home-made DVDs, WinX DVD Ripper also features powerful ability to rip commercial copy-protected DVDs successfully circumventing CSS, region codes, RCE, UOPs, Sony ArccOs on DVD movies. 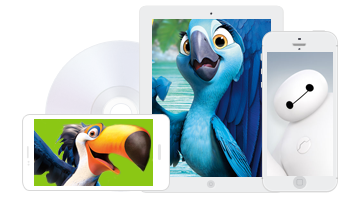 WinX DVD Ripper offers several well ready-made iPhone profiles including iPhone 8/7/6s/6 (Plus), SE, 5s/5c, 5, 4s, 4, 3G/3Gs. Those profiles embeds perfectly matched parameters with video/audio specs of every model. Because of this, some problems like MP4 file ripped from DVD cannot be played on iPhone will never happen. This best free WinX DVD Ripper for iPhone can deliver possible highest vide/audio quality, even nearly lossless. What's more, it offers adjustable parameters so that users can freely set values of bit rate, frame rate, resolution, aspect ratio etc, to output video with desired effect. A fast DVD ripper is definitely preferred choice when we trying to free rip DVD to iPhone. Taking full advantage of Hyper-threading Tech and Super Encode Engine, WinX DVD ripper can deliver an extremely fast ripping speed, ripping a feature-length movie to iPhone using a shor time (also depending on DVD drive speed and computer configuration). Now, free download WinX DVD Ripper on PC (compatible with Windows 10 and lower) and follow the guide to free rip DVD to iPhone. If you are a Mac user, please switch to Mac version. User guide is similar to that on PC. Step 1: Insert a DVD disc into DVD drive on your computer. Launch WinX DVD Ripper. Click DVD Disc button to load DVD content. Besides VIDEO_TS folder also can be the target source for ripping to iPhone. Step 2: Seconds later, a list of all DVD titles will be given with auto-checked main title. Click "to iPhone" tab and select matched profile setting with your iPhone model. Optional: This WinX free DVD to iPhone ripper allows you to adjust audio/video parameters, like bit rate, frame rate, aspect ratio, resolution and audio sample rate. Step 3: Browse to set destination folder and click Start button to start ripping DVD to iPhone. Free download the fastest DVD ripper – WinX DVD Ripper Platinum – to rip and convert any DVD movies, workout DVDs, (Disney) 99-title DVDs, Japanese AV DVDs and other specially encrytped DVDs to iPhone, iPad, Android, Windows Phone etc, or common video formats like MP4, AVI, WMV, MOV, FLV, 3GP with crisp output video. It can access to all DVD copy protections helping you copy protected DVD movies hassle-free.